When those Hollywood socialites showed up at Skull Island they had no idea what was waiting for them. How were they supposed to know that those dramatic mountain peaks were hiding giant gorillas and a couple left over dinosaurs to boot? And then where would they get the idea that a gargantuan simian would kidnap their leading lady? Well, one things for sure. Those big wigs should have known better than bringing King Kong back home with them. After seeing him take down that giant alligator beast they should have shrugged their shoulders and decided to head back to the city and never come back. What's truly nutty is that they all were on board to strap a gorilla that's the size of a country church to the back of the boat and head home with it to make some cash. 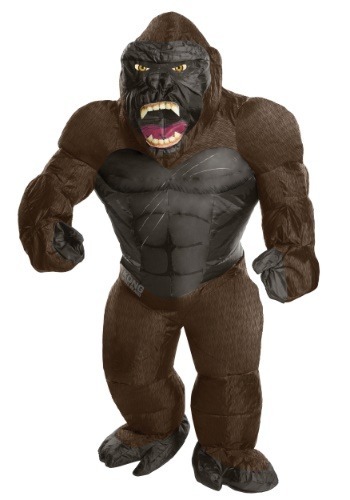 Don't they realize that even a normal sized gorilla is ten times as strong as any man? Anyway, hate to say it but it serves them right that they've got a humongous gorilla on a rampage on their hands. This Halloween it's easy to become King, just put on this inflatable suit and puff up to size, as long as you stay away from the Empire State Building the military should leave you alone. You'll show those apes how dignified King Kong had been the whole time they were strapping him down and calling him names. If you bring along your leading lady you can finally have that date you had in mind when you picked her up on Skull Island. With your reputation there's no way that rooftop patio downtown will make you wait for seating, after all you're a celebrity!